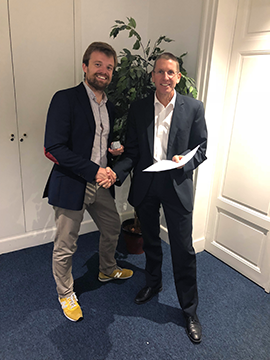 RUAG Space and SWISSto12 signed a partnership agreement at World Satellite Business Week in Paris, France and the partners have committed to supply future satellites missions, including constellations of telecommunication satellites, with crucial antenna solutions. RUAG Space and SWISSto12 partner to supply active phased array antenna products – the backbone for satellites in future LEO constellations. Emile de Rijk, CEO SWISSto12, (left) and Peter Guggenbach, CEO, RUAG Space, signed the agreement. Photo is courtesy of RUAG Space. The collaboration will focus on the development, design and manufacturing of phased array antenna products that leverage the unique and complimentary offerings of both companies. Peter Guggenbach, CEO of RUAG Space, said the company will offer upcoming constellation programs an antenna solution that is state-of-art, both in performance and price. The firm is excited to partner with SWISSto12 and incubate this progress in our industry.